State of the VDI and SBC Union survey results are in! So recently I wrote a blog about Login PI + RES ONE Workspace and I also mentioned that the yearly state of the VDI and SBC union survey was going on. Now it’s finished and the results are in! In this blog I will give a quick review of some of the results that I found interesting of the survey. Want to see the results? Download your copy today – compliments of Login VSI! 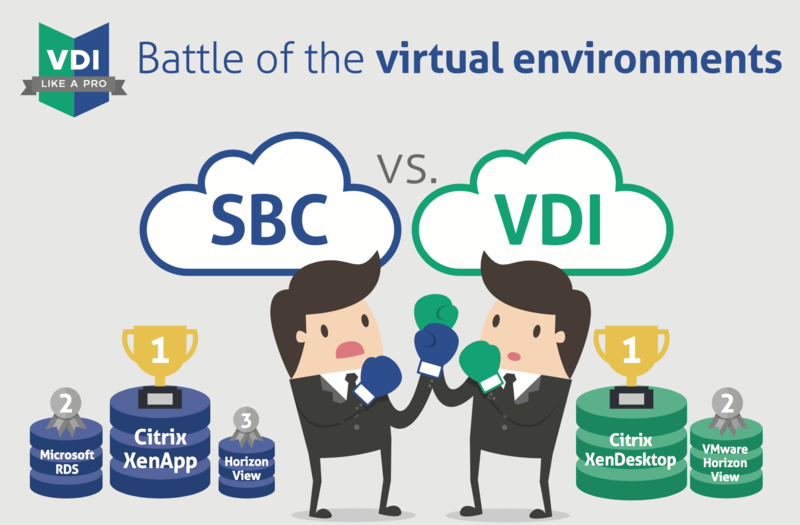 What is the State of the VDI and SBC Union survey? It’s the industry’s biggest annual survey about the usage, configuration and trends in the Virtual Desktop Infrastructure and Server Based Computing industry. 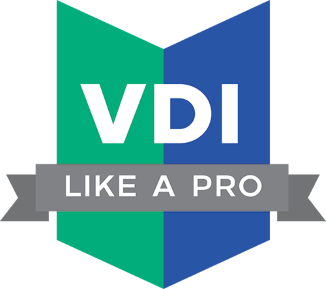 It is conducted by the VDI like a pro team. Their primary members are Mark Plettenberg ,product manager at Login VSI , and Ruben Spruijt , CTO of Atlantis. And much like my blog their goal is to share knowledge. By using the knowledge of the results report you can keep yourself informed and write better technical designs or just keep up with current trends. This image shows the Broker usages of SBC computing. And I find it really interesting to see that so many deployments use a new version of Citrix. In the past you would often see that Citrix would be installed and then just got some hot fixes. Not many companies would keep up to date with Citrix. So that has changed and Citrix’ quarterly update cycle seems to be working. I think it’s a really positive trend to keep up with new features and security fixes. 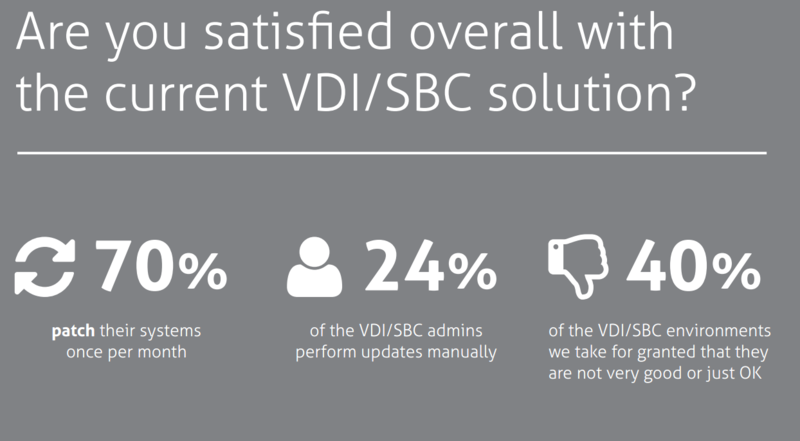 Another survey result is that 40% of the correspondents find their overall VDI/SBC solution not very good or just OK. I am surprised by this because I can remember a time without SBC and VDI and trying to keep 100 Windows NT PC’s running in a company was a real hassle. Using Norton Ghost for new PC’s was mind numbing work and the countless user issues would drive you mad. Since my first experience with the VDI/SBC solution (Windows 2003 Terminal Services) I really fell in love with it ! I have to say what also made it really great to me is a good UEM (User Environment Manager) solution like RES ONE Workspace. So speaking of UEM here are the results of the survey about UEM usages. I’m really pleased to see that so many correspondents use some kind of UEM. And of course it’s great to see my favorite RES ONE Workspace comes in second. I think using a UEM is the key to a great VDI/SBC solution and also helps to secure the environment. For example see my article about Ransomware. 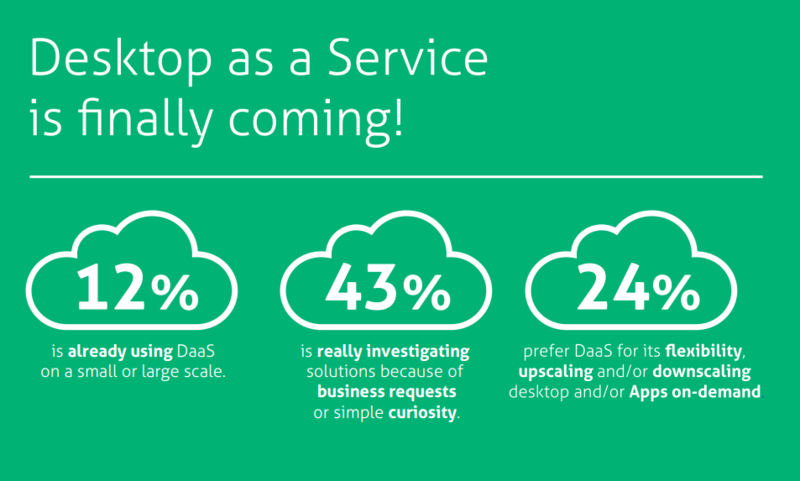 The last result I want to point out is the fact that DaaS (Desktop as a Services) is getting more popular. And I think we will see this trend grow in the years to come. I think that if it is possible for companies they can better subscribe to a DaaS solution than invest in their own hardware. Because this will free up the IT staff from running the business (Maintenance and Troubleshooting) to enabling and innovating the business. So don’t forget to download your copy of the results here – compliments of Login VSI!